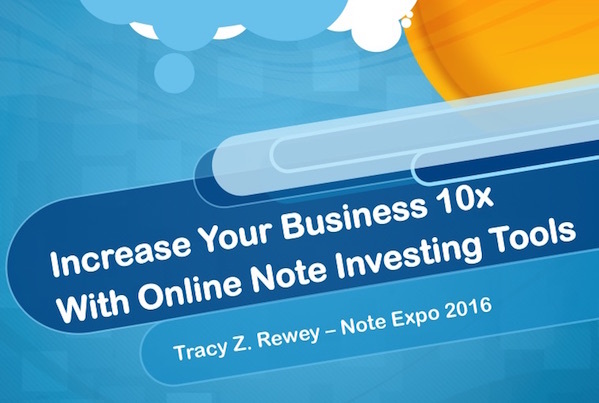 Earlier this week at Note Expo 2016 it was standing room only in the info packed session on How To Increase Your Business 10x With Online Note Investing Tools. I was honored to give a repeat performance later that afternoon and want to say thanks to everyone that attended. As promised I’m sharing the presentation slides and some helpful links here in this follow up post. But first I want to say… What a great event! Congrats to Eddie Speed, Bob Repass, Susan DeLaGarza, Czarina Harris, and the whole Note Expo team for hosting a first-rate industry convention. The speakers and attendees were top notch! Oh and guess what was missing? A bunch of selling and product pitching from the stage. Or as one person said on the elevator ride back at the hotel, “That convention was a whole lot of meat and potatoes!” Makes sense right? After all we were in Texas! Ok, so back to those items requested during my session (which will also help anyone that wanted to go this year but couldn’t make it). The note business is made up of online and offline marketing methods. For years we have used a combination of Direct Mail, Ads, Referrals/Networking, Brand Building and Online Marketing as outlined here in How To Find Notes. As we looked for ways to become more effective (and reduce a $5,000+ marketing budget) we gravitated towards online efforts for their speed and efficiency. This session was a look inside my toolbox! Social media can be a whole lot of noise (and photos of what people ate for lunch). However there are some gems and in the note business that is LinkedIn. I have been encouraging readers for years to start using LinkedIn. Start by reading my LinkedIn tips here then head over to connect with me here and join over 4,700 of us in the Note Investor Group here. This online software is crucial to deal structuring and provides a visual print-out of complex financial calculations. If you want to structure deals like the 50/50 partial or the church note you want to have a financial calculator and the TValue™ Amortization Software in your toolbox! If you want to learn how to use these for the note business then check out the Calculating Cash Flow Notes training. List building and email marketing are great ways to cultivate professional referrals including real estate pros, attorneys, CPAs, and investor groups. It starts with offering a free report to encourage the opt-in and using an email marketing service like Aweber or Mail Chimp. A business blog (like the one you are reading right now) allows you to create and share information. 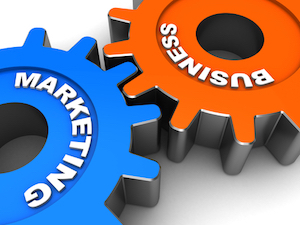 The new buzz word is content marketing and it works for our business too. It’s next to impossible to have a business without a website in our mobile technology crazed world. It provides credibility and works for you 24/7. You don’t have to use our affordable website solutions but please build something using these tips. If you want help using any of these great resources check out our Note Investing Tools website! It was great meeting so many of you in person and I hope to see you again at Note Expo 2017. Hi Tracy, I’m sorry I missed the expo and your talk this year. I had a lot of frineds that attended that said it was great. I’ve been in the note business since 2007 with a focus exclusively on np 2nds. Just recently we have decided that we’d like to branch out into 1st’s as well. Your recent podcast with my friend Brecht on Distressed Pro inspired me to finally put things into action. I really enjoyed it and got some great info from it. I just wanted to thank you for the inspiration and the resources you make available. I look forward to meeting you at some point, becomig acquainted and perhaps even doing some business down the road. Hello Peter, Glad you enjoyed the podcast. It was fun participating in the interview with Brecht. Performing 1sts will seem tame to you after non performing 2nds! I bought your website service from you, and am very pleased with it. I also talked to you briefly at the Note Expo 2016, and you are are real as advertised. Thank you. Thank Huan for the kind words. It was a pleasure meeting you and working together on your site!